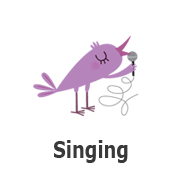 Sing and use instruments such as a rattle while you sing. This will help with learning the beat as well as keeping rhythm. Most importantly, it is fun and keeps baby’s attention. Play with rhymes and songs. Nursey rhymes are a great way to incorporate rhyme and song together. Music includes rhythm and rhyme, which is part of our everyday language. Eventually, babies will recognize rhymes and rhythms. Use props while singing songs. If you sing, “5 little monkeys,” use a stuffed monkey to act out the song. Finger plays and nursery rhymes provide great opportunities to combine language and fine motor skills.